Not quite sure what this means but have this feeling it is good 🙂 What do you think? I guess what I meant to say is similar to this. Next Yes, Yeah or Ya? I felt bad actually. For the first time, felt that these guys are worse politicians than in India. I think the economy might get really bad and things could end up getting worse world over. Hmmm.. Hope all of us keep our jobs. What do you mean by saying you have the feeling that it is good. This does portray more trouble for the already hit economy and hope and pray that it doesn’t come to the point of losing more jobs. This is not good news with the upcoming election, too. 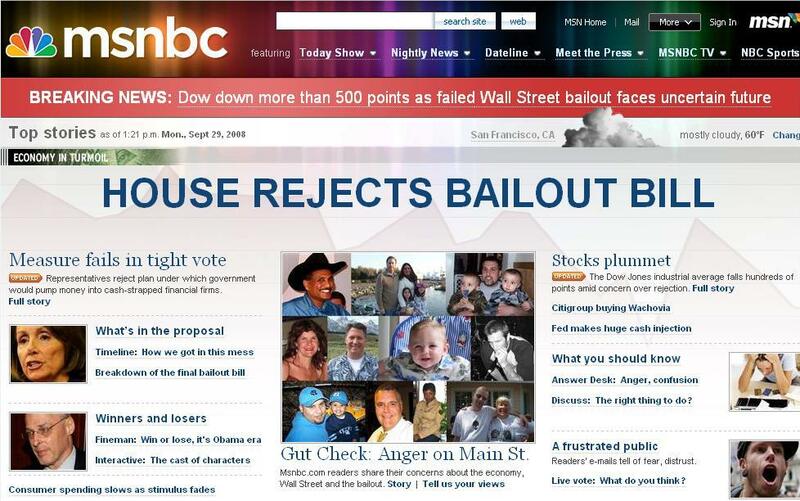 I didn’t agree with the idea of the bailout and was quite pleased to see that it was rejected. A free market should be just that – A FREE MARKET! The government shouldn’t interfere with the economic mechanisms in place. The economic structure shuld be robust enough to run itself, and, if a ‘correction’ is required, then by all means, let it take its course. @Apar: I guess what I was talking about is that for the first time I saw the elected leaders take the opinion of the people on the street. Am sure this means a lot of bad things for a lot of people but my personal view was that the bailout would not do much good other than inject a temporary sense of hope on Wall St.
@Rekha: It is true there will be a recession but it the effect of a whole lot of things that were wrong from the outset. Like I said, I don’t think the bailout would have stopped it from happening. Might have just delayed it. @Mitr: I believe the election being so near is what caused it to fail. The folks in DC want to keep their jobs. This whole thing if it had happened a couple of years ago the outcome would have been different. @Spillay: You hit the nail on the head. You echo my thoughts and put it so well. I really believe the market will ‘correct’ itself and run its course. I agree…..Those CEO’s take home millions and this is the result they give….I agree wall street and actual economy is different and I support the govt’s decision to not bail them out! It portents disaster if the govt bails them out now….sets a bad precedence….